The other day, I was humbly reminded how IBD affects people of all ages and walks of life. My friend's tween-age son has been struggling with Crohns for a few years, in helping the family through confusing times, I was motivated to sit down and write about healing my almost forgotten Ulcerative Colitis flares. I am not trying to boast about my remission, instead, I wanted to emphasise even when the body has been dramatically affected by the chronic disease, there is still hope in returning back to a state of health. It is the body's main focus to repair and thrive. In this post, I will share a few of my tips for overcoming IBD flares as Reduce Stress, Sleep, and Bowel Rest with Nourishment. I hope some of these tips will resonate with fellow IBDers searching their way towards healthy bodies. Luckily, by following a healing diet like Paleo Autoimmune Protocol ( AIP ), I was already reducing some of the stress to my body from consuming inflammatory foods found in a Standard American Diet ( SAD). However, when it comes to lifestyle stress, it was a bit more complicated. Once I got a couple flares under my belt, I could predict another looming around the corner by observing my elevated stress level. Managing stress was one of the biggest hurdles against remission and now I make a conscious effort in putting Self Care on top of my to-do list to keep stress levels in check. When I sensed my body become out of balance, I reviewed my schedule to accommodate more down time. Then, I turned down unnecessary obligations and asked for help to maintain any essential duties as I focused on healing. After all, even as a caregiver, what good am I to others when I was unwell. Most people assumes sleeping 8 hours is enough, but when you are battling autoimmunity, you will probably need more hours under the covers. When I was in a flare, I slept until my body told me to get up. During my worst flare, I could easily sleep 18 hrs and still be exhausted. My days blended into nights, but I listened to my body and sleep more. Another way to rest beside being in bed was relaxing in an Epsom Salt bath. At times, I would alternate between the two to prevent bedsores and boredom. Sometimes I found it hard to quiet the mind, so I turned to meditation podcasts, like Louise Hay, and Essential oils, like lavender, to guide me into a more relaxed state. To learn more about getting restful Sleep to support healing- check out Go to Bed by The Paleo Mom. The idea of bowel rest came to me after my first preparation for colonoscopy, instead of taking the recommended clear diet of sugary juices and Sports drinks, I consumed my homemade bone broth, grass fed gelatin and coconut water. To my surprise, my flare symptoms subsided right after my scope. I understood that as my digestion was given a break, my body could focus on repairing my gut lining. In regards to the duration of bowel rest, I really had to listen to my body. I also found it helpful to add fats, like coconut oil, in small tolerable increments to provide my body with extra energy. My bowel rest practice evolved as my body healed, I was able to consume more variety of liquids. This lead me to search for more easy to digest liquid nourishment options to fuel the body during this healing process. While preparing bone broth is easy, it can be time and energy consuming, especially when you are not well. Grass Fed Collagen protein is still my favorite form of gut healing supplements to this day. Recently, I was contacted by Primal Health and Nutrition regarding their unique Paleo and Autoimmune Protocol compliant line of products, Paleo Perfection Protein. Keeping my fellow IBDers in mind, Paleo Perfection Protein may be a great option as a convenient periodic meal replacement or an easy to digest liquid nourishment in supporting bowel rest. For those who are intolerant to common allergens, Primal Health and Nutrition has made their product free of dairy, nuts, seeds, soy, corn and legume. Comparing to the majority of protein supplements on the market, Primal Health and Nutrition uses Grass Fed hydrolyzed beef ( aka. Collagen) as their protein source instead of whey. With the addition of nutrient enhancing organic fruits and vegetable, Paleo Perfection Protein offers a fuller body texture when comparing to other Collagens I have used before. Primal Health and Nutrition currently offers two flavours, “Chocolate” Cherry Flavour, which is made with carob instead of chocolate and a Natural flavour. After testing their products, I found the "Chocolate" Cherry Flavour a bit sweet ( with stevia) tasting for me. By adding coconut milk/cream ( you may use any high-quality fat or your choice of tolerable “milk”), I found the perfect balance in taste and richness in a cup I would gladly serve my children as a treat. In fact, it was almost hard to believe this easy to make supplement is tasty, guilt-free and AIP compliant. Lastly, I feel their prices are reasonable especially for the quality of the ingredients used. Although I still believe it is preferable to heal our bodies with real whole foods, this product can provide a good alternative for a clean source of on-the-go protein supplement. If you are on the AIP protocol, I would suggest that you give this a go once you have gotten past the elimination phase and successfully re-introduced ingredients used in the product. If you want to try Paleo Perfection Protein, as my blog audience, you can save 20% off of the retail price. Simply use coupon code "AFox" to redeem your 20% off here ( Offer expires 12/31/2016 ). Below is how I made my taste testers ( aka. my kids) their cups of guilt free and nourishing hot "cocoa". There was no surprise that they loved it. Add all ingredients into a blender and blend at low speed until smooth. Be careful when handling hot liquids. Enjoy. In conclusion, it was bittersweet to sift through faded memories of Ulcerative Colitis flares, I remember how terrible I felt at my rock bottom and all the times in between. The pain, weakness from undernourishment, and fears of whether I would ever feel well again eventually subsided as I follow my trial and error routine of Reduce Stress, Sleep and Bowel Rest with Nourishment. 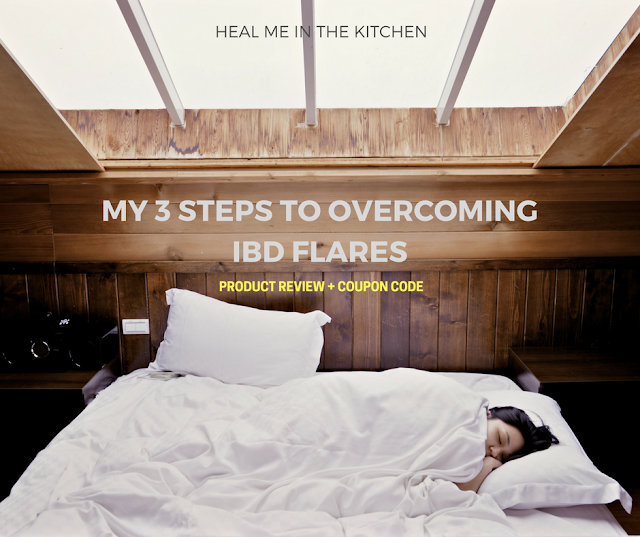 My above-mentioned tips to overcoming IBD flares are only a few of countless out there. They have worked well to further my healing when I focus on them. I encourage every IBDer to get creative, be determined and continue to search for ways to heal your gut. Remember, the body is designed to repair and thrive.